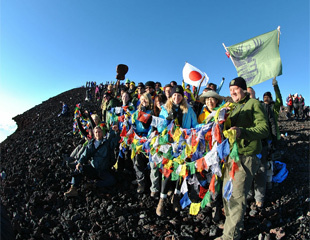 Mt Fuji Rocks took place in August 2010 when a band of LHS trekkers summited Mt Fuji in Japan in support of the foundation. 21-29 August 2010. Mt Fuji Rocks was 2010’s major trek for LHS to Mt. Fuji and the “Land of the Rising Sun”. Read the Mt Fuji daily blog and see the photos on the LHS USA site. 40 musicians, cancer survivors and supporters made a symbolic pilgrimage to the highest mountain (3,776 m, 12,388 ft) in Japan timed around the “Fire Festival”, the official closing ceremony of the hiking season. They did so in order to bring love, hope and strength to the world. 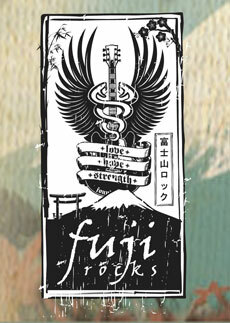 Funds raised from Mt Fuji Rocks will be used to support global cancer care and expand the global bone marrow testing campaign. Cancer is now the leading global killer and more and more, patients are finding bone marrow transplants to be their only hope at surviving numerous blood cancers including, Leukemia, Lymphoma, Multipe Myeloma and other diseases, such as, Sickle cell and Aplastic anemia. As our world becomes more diverse, so is the need for a multi-cultural database of willing bone marrow donors. By conducting saliva-based bone marrow drives, we are increasing the odds of survival for thousands of patients around the globe. The need for donors, especially multi-racial donors, is growing. Every 4 minutes one person is diagnosed with a blood cancer. At any given time, over 6,000 patients from all over the world, and of all ethnicities, are searching the registries for a match. The number of people who identify themselves as multiracial in the United States alone has grown from 3.9 million in 2000, to 5.2 million in 2008. In the United States, ethnic minorities have a 30-40% chance of finding a match from the existing registry whereas, Caucasians have an 80% chance of finding a match. Minority donors (Asian, Pacific Islander, African American/Black, Hispanic/Latino, Native American, Multi-Race) make up only 25% of the current U.S. National Registry. And, multi-racial donors make up only 3% of the 7 million registered donors*. Love Hope Strength believes that all people, regardless of nationality, color, race, religion, age or socioeconomic demographic, deserves the right to early detection, proper screening and cancer care. This includes the right to locate a bone marrow donor. LHS is currently conducting drives in the United States through DKMS and United Kingdom through the Anthony Nolan Trust. LHS has registered over 4,000 patients and located over 20 matches for patients around the world. In conjunction with UICC, LHS seeks to make marrow registration a global cancer initiative.